Set yourself a reminder for September 30th. That’s when the Rosetta spacecraft will make a controlled descent and crash on the surface of Comet 67P/Churyumov-Gerasimenko. After 12 years in space and nearly two years circling around this dusty, weirdly shaped comet, this historic mission is finally coming to an end. Comet 67P/C-G, is heading away from the sun and towards the orbit of Jupiter. That means there’s increasingly less solar energy available to power Rosetta and its instruments. Rather than just let the spacecraft die a slow, miserable death, the mission planners have decided to crash the probe into the comet, albeit very, very slowly. If all goes well, it will make its controlled descent on September 30th at about 20 inches per second, which is about half the landing speed of Philae, the first probe to ever touch down on the surface of a comet. While this is happening, Rosetta’s instruments will be feverishly collecting and transmitting data, including high resolution images. That means we’ll get to see some spectacular close-up shots of this extraordinary comet. 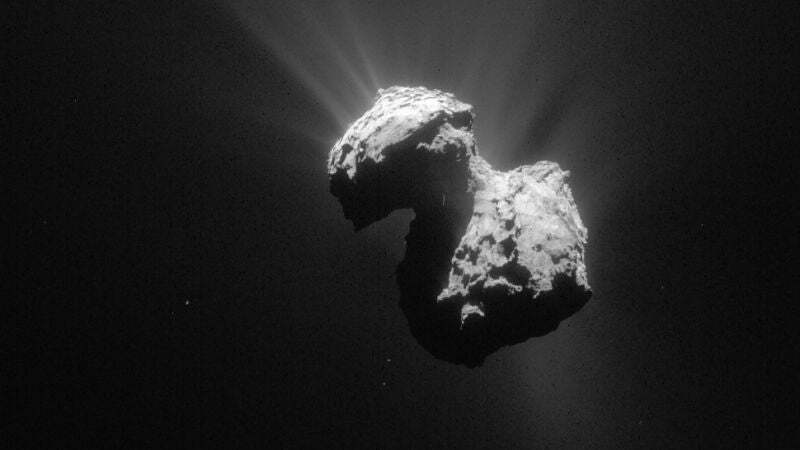 Getting the spacecraft to crash into the comet is not going to be easy. Its operators will start to change its trajectory in August and instigate a series of elliptical orbits that’ll take it nearer and nearer to the comet’s surface. They’re going to have to crunch the numbers like mad, and make sure they’re taking account of 67P/C-G’s highly irregular shape. It’s a far more complex plan than that for Philae’s landing, said ESA Rosetta spacecraft operations manager Sylvain Lodiot. “The closer we get to the comet, the more influence its non-uniform gravity will have, requiring us to have more control on the trajectory, and therefore more manoeuvres — our planning cycles will have to be executed on much shorter timescales,” Lodiot said. If all goes according to plan, the final adjustment will be made about 12 hours before impact when the spacecraft is about 12 miles (20 km) away from the comet. After it crashes, no further communication is expected from the probe. Sad as it may be to see this mission come to an end, it has proven to be one of the more fascinating and scientifically important space missions in quite some time. In addition to snapping thousands of images and collecting troves of data, Rosetta managed to place the Philae lander on the surface. It didn’t go according to plan, dying shortly afterwards, but the attempt still managed to produce meaningful data.